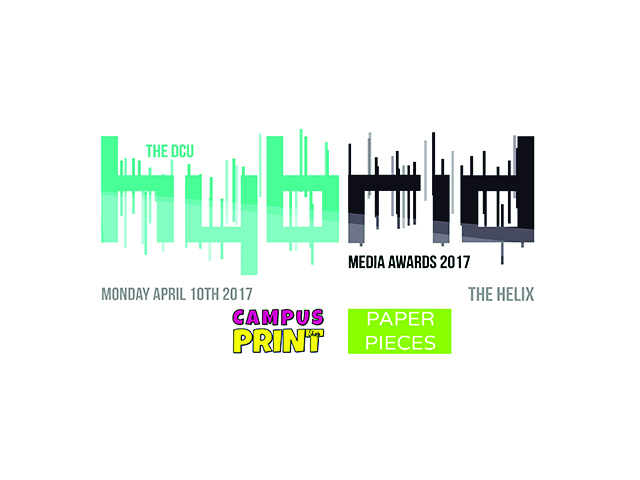 DCU’s own Hybrid Student Media Awards, run by the Media Production Society, took place on the 10th of April. Last Thursday saw the end of a slew of April student award ceremonies with the Board of Irish College Societies Awards in the Sheraton Hotel, Athlone. DCU’s own Hybrid Student Media Awards, run by the Media Production Society, took place on the 10th of April. The Student Media Awards (Smedias), hosted through Oxygen.ie this year, ran on the 6th. Some of the judges for the Hybrid Awards this year include Gavan Reilly, a political correspondent for TodayFM, Graham and Nathan of The Zoo Crew on SPIN1038 (Arts/Features Show of the Year), and Brent Pope, an RTÉ rugby correspondent (Journalist of The Year). Oisín McQueirns took home Sports Journalist of the Year, The College View won Website of the Year and Publication Design of the Year, and Sarah McLaughlin won DJ of the Year. Áine Monk took the title of Iriseoir na Bliana, and Zainab Boladale won Journalist of the Year. DCU showed a strong presence at the Smedias, with 18 nominations for DCU students. Although nominated for Newspaper of the Year, The College View didn’t win the award, which instead went to The College Tribune of UCD. The Football Writer from DCU won Blog of the Year, Hannah Kingston won short story of the year, and Stephen Murphy of DCUfm won Radio Journalist of the Year. While DCU did not win at the Board of Irish College Societies Awards, the publicity campaign run by DCU’s Media Production Society for the 24 Hour Broadcast was nominated for the Best Publicity Campaign award. The campaign featured a video, starring Deputy Events Manager of MPS Laura Horan, speaking about her time being homeless in her childhood. The video became a viral hit in Ireland, with websites such as Spin1038, JOE.ie, and Lovin Dublin, and The Irish Independent featuring the video. “It was such an amazing opportunity to be nominated for a bics award for our publicity campaign and having our First Year Rep nominated for Fresher of the Year. Although we didn’t win, it was amazing to see the work of other college societies and understand the passion we all share,” said Horan.